Saturday — Larry Burgess Las Vegas Invitational at Sunset Park, 7:30 a.m.
Arguably the area’s top meet each season, the Larry Burgess Las Vegas Invitational kicks off with a middle school race at 7:30 a.m. The first varsity race will be at 9 a.m. Hurricane (Utah) is the defending champion in both the boys and girls small-school division. Page (Arizona) won the large-school boys title last fall, and Cedar City (Utah) took the large-school girls division. Friday — Green Valley at Canyon Springs, 7 p.m. The Gators are off to a 3-0 start and will hit the road to take on the Pioneers, who are the favorites in the Northeast League. Friday — Arbor View at Legacy, 7 p.m. The annual “Battle of the Bulls” rivalry feature two teams coming off disappointing losses. 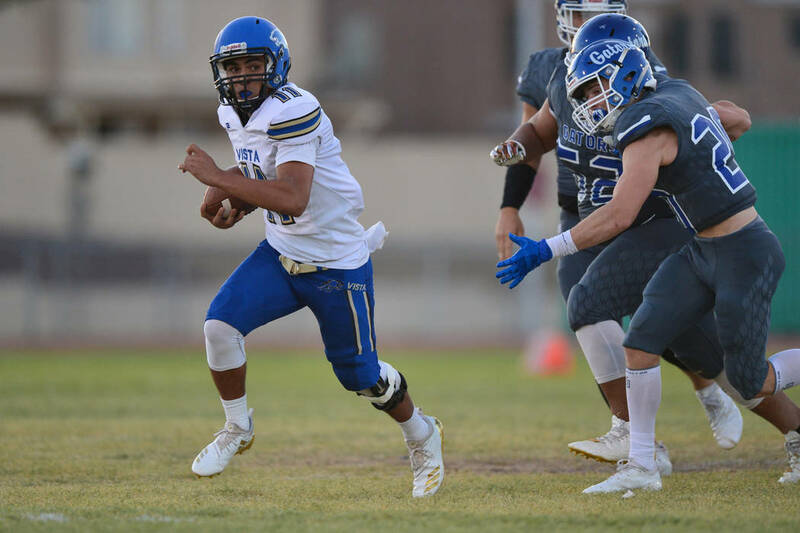 Friday — Kaimuki (Hawaii) at Sierra Vista, 7 p.m.
Sierra Vista quarterback Jordan Solomon will take on the school at which he started for two years at quarterback. Friday — IMG Academy (Florida) at Liberty, 7 p.m. Things don’t get any easier for Liberty this week as the Patriots take on the nation’s No. 1 team as part of the Polynesian Football Classic. Saturday — Chandler (Arizona) vs. Faith Lutheran at Liberty, 4:30 p.m.
Another game in the Polynesian Classic, the Crusaders will look for a second consecutive win against one of Arizona’s top teams. There also will be two other games on Saturday at Liberty, with Farrington (Hawaii) playing Carson (California) at 1 p.m., and Bingham (Utah) taking on Mountain Pointe (Arizona) at 8 p.m.
One of the top leagues in the state all meet together in what will be a benchmark of where the squads are this season. Tuesday — Faith Lutheran at Cimarron-Memorial, 3 p.m. The Spartans host the Crusaders in a battle between Mountain League rivals. The Spartans have impressed early, jumping out to a 4-1-1 start. Thursday — Durango at Foothill, 3 p.m. The Trailblazers are off to a blistering start to the year, and visit a new Desert Region rival. The Falcons have stumbled a bit at 1-2-1, but are always a contender. Friday — Desert Pines at Sunrise Mountain, 3 p.m.
Two of the best Class 3A teams from last year, the now-4A Jaguars head east to face the defending state champions. Thursday — Green Valley at Silverado, 3 p.m. The Gators lost to some of the best teams n Nevada by just one goal in the Las Vegas Kick-Off, and visit a Skyhawks team with high expectations for the year. Friday — Palo Verde at Faith Lutheran, 5:30 p.m.
Two Mountain Region juggernauts clash, as the Panthers, who are 4-2-0, take on the Crusaders, who are 2-2-0. Wednesday — Coronado at Clark, 3 p.m. The Cougars and Chargers both qualified for state last year and figure to be two of the top teams in the state again this season. Thursday — Bonanza at Arbor View, 3:30 p.m. The Bengals are 5-0 and will head to play the Aggies, who are 2-2 and are looking to reverse their fortunes. Wednesday — Shadow Ridge at Las Vegas High, 6 p.m. The defending state champions are 6-4 and trying to regain their groove. They’ll head to play the Wildcats, who are off to an 8-3 start this season. Thursday — Green Valley at Desert Oasis, 6 p.m. The Gators are 4-3 and will head across town to play the Diamondbacks, who have won seven of their first 10 matches of the season.